Taitt was born on Tau Ceti II in 2348 to parents George Taitt and Pearl Taitt. At Starfleet Academy she wrote her senior year thesis on Solar Dynamics. 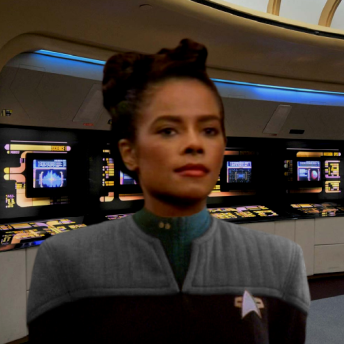 She graduated in 2369 and earned a prestigious posting as a science officer to the USS Enterprise-D. Taitt was one of the few officers of the skeleton crew left behind after most of the crew transported down to the Borg planet in search of Lieutenant Commander Data. Taitt served as a tactical officer while Doctor Beverly Crusher was in command. She was slightly hesitant to accept responsibility and was later relieved after Lieutenant Barnaby returned to the ship, although Crusher ordered her to remain on the bridge at the science station. The Enterprise-D was subsequently forced to hide in the corona of a star, trapped by the Rogue Borg ship. Using information from her senior honors thesis, Taitt developed a plan to fire a carefully aimed particle beam to create a solar fusion eruption which would engulf the Borg vessel and allow the Enterprise-D to escape. The plan worked, and the eruption destroyed the Borg ship. Crusher commended Taitt for her original thinking. Crusher christened the move the "Taitt Maneuver." In late 2379, Zandra was reassigned to the Odyssey as the Assistant Chief Science Officer.